In the world of design and architecture, bigger often means better. Big spaces and grand designs equal big rewards, and big impressions. But across the country, a different breed of architecture is gaining momentum. Enter the tiny house movement. Following an American trend, the tiny house movement is a social push towards downsized living. Hundreds of Australians – families included – are joining the movement, and their reasons are varied: environmental, financial, ease of construction. Put simply, living smaller means living simpler, without the concerns of consumption and expense that big houses so often engender. It’s about re-evaluating what we have and want, what we need and love. In compensation for their limited size, tiny houses place great emphasis on design, often utilising dual purpose features and multi-functional furniture. Vertical space optimisation is a common strategy – think beds over the kitchen, and storage at the roof. Tiny houses have all the amenities of regular sized homes, though clever planning and design is essential. Say, for example, a dining room table that lives under the loft, which can be brought down to table height via a pulley system when needed. In addition to costing less, tiny houses encourage less cluttered living, reducing ecological impacts too. The movement has allowed many Australians to build their own homes and live mortgage free in an unaffordable property market. Tiny living is about more than buildings – it’s a radical change in the value we place on material necessities. 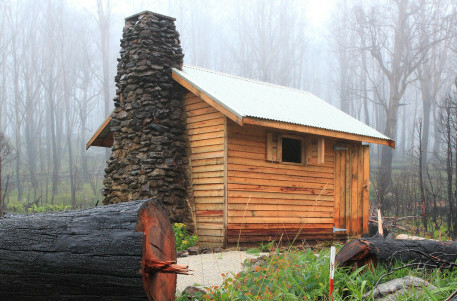 At just 36 square metres, the Box House (pictured above) is a tiny living space in the middle of the bush, hundreds of kilometres south of Sydney. Designed by the late architect Nicholas Murcutt, one of the founding partners of Neeson Murcutt Architects, the Box House appears to be just that – a wooden box. But in an operational sense, it’s so much more. The eucalyptus walls have no insulation or inside finish, giving its inhabitants a direct sense of the outside world. Rainwater is collected in an elevated tank, and the fully glazed north wall visually blurs the spatial bounds of the minute dwelling. The space is small and raw and connected to its surroundings, offering a different sort of paradise. While the tiny house movement is gaining momentum, it realistically has a ways to go before it will influence living models in the mainstream. A recent article by the ABC reports that newly built Australian houses are “bigger on average than anywhere else in the world at 245 square metres for new freestanding homes, and 215 square metres for new homes overall,” demonstrating an increase in housing sizes of roughly 10 percent in the last decade. The proliferation of imposing ‘McMansion’ style housing at the suburban fringe is a concerning trend, a by-product of rapid estate development caused by urban sprawl. Though the tiny lifestyle is as yet an unrealistic alternative for many, as a reaction against the excessive consumption of modern life, the movement advocates a way of living which seeks to lessen our environmental footprint in a climate of ever increasing high density.